As Tony’s Sourcer you are responsible for the sourcing of ingredients and packaging materials. This includes the management of price levels and other commercial conditions, the social and environmental footprint and the availability of these materials aligned with the production of the bars at Tony’s co-manufacturers. You will focus on costs, availability, quality, traceability, environmental footprint & scalability. Yeah! You work closely together with our Sourcing Chef Sanne en Sourcing Sous Chef Joost managing the partner network, fixing operational issues and supporting NPD’s. Internally you work together with Tony’s Product Development team (Marketing, Sales, Production, Quality and Logistics) to develop new packaging and search for new ingredients. Together with Marketing, Sales and our Captain Co-Pack Marloes you also work on developing customer specific packaging like gift-boxes and displays. And when it comes to sourcing, you negotiate procurement costs- and conditions contributing to delivering the financial budget and gross margin targets in business cases and in the P&L. The solid supply agreements that you create always make legally sense (duh..). You also build and maintain long term relationships in a network of reliable, affordable, socially engaged suppliers and partners for the supply of ingredients, semi finished products and packaging materials. And you are responsible for developing and implementing a sustainable packaging policy. You have around 4 years of relevant work experience within food. You are a pro at negotiating and building lasting relationships. You have experience in sustainable packaging. Traceability, sustainability and social & environmental impact are just as important for you as it is for Tony’s. You understand the supply chain and the funnel from idea to finished product. You are able to manage and oversee all your projects and tasks, and you work well with time constraints. You speak English fluently and you are a great communicator. You always challenge yourself and team Tony’s to increase ambitions. Dare to make mistakes and learn from them. Raise the bar! 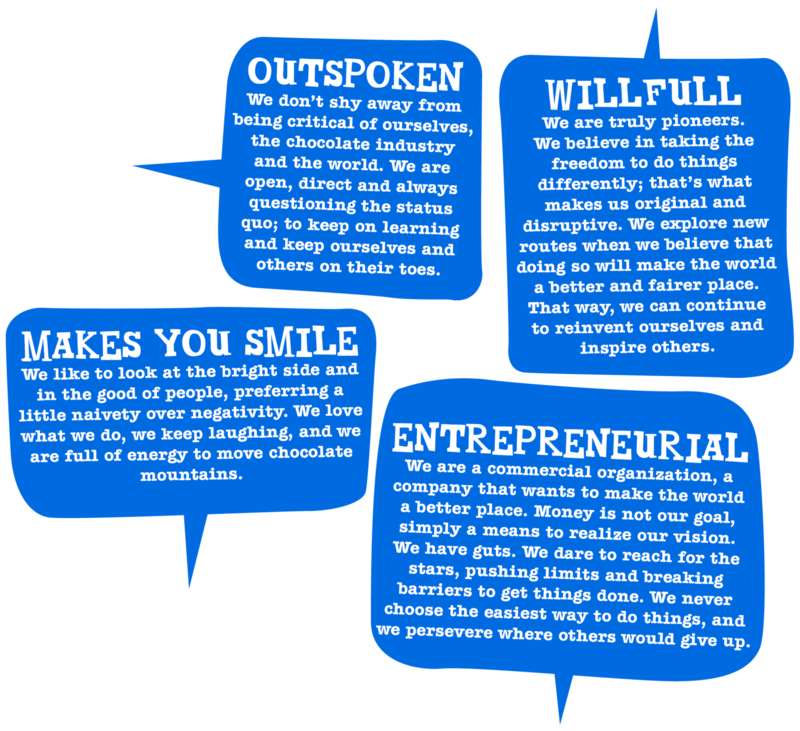 You feel a clear connection with our core values: outspoken, willfull, entrepreneurial & makes you smile. And lastly, you can make chocolate from anything and everything: maintain and support a can-do attitude, jump in wherever necessary, whenever necessary. An enthusiastic team of great, driven colleagues with a lot of love for our mission and Tony’s Chocolonely. An inspirational and fast growing international work environment in which you can show that things can be done differently and you will get challenged to raise the bar. The possibility to help build Tony’s Chocolonely and our mission. Only together we can change the chocolate industry! We want you to take a minimum of 28 annual leave days, that’s right minimum. More is fine too. With a permanent employment contract you are eligible to join our Employee Participation Plan; Tony’s Golden Wrapper. We take your development very seriously and have annual personal training budgets. A super tasty lunch & enough (healthy) snacks. Better than at home, we hear often.. Working out during work hours; that keeps you sharp, so we are all in! And your sports outfit is on us, of course. You will be part of Tony’s Operations team and you report to Sanne our Sourcing Chef. An awesome office in the middle of Westerpark in Amsterdam. We all work hard and have fun. Loads and loads of fun! Because we looooooooooooooove having fun at work. Don’t get us wrong, we know how to work our socks off too. And of course, lotssss of chocolate. Show us that you are THE candidate that we are looking for! Send us your application before April 29. We will invite the best and most convincing applicants for an interview (with chocolate..). There will be 2 interviews and a coffee with Henk Jan, our Chief Chocolate Officer, that will take place in May. Tony’s Chocolonely wants to make all chocolate 100% slave free. Not just our chocolate, but all chocolate worldwide. Not exactly the average company, right? Instead a chocolate company whose primary goal is to resolve a social issue in the world. In 2005, Tony’s Chocolonely was founded by journalists of the Dutch TV-program “Food Unwrapped” when they discovered that the large chocolate manufacturers used cocoa from farms with children slaves at work. Since then, we have grown to be biggest chocolate brand in the Netherlands. Tony’s Chocolonely wants to make people aware of the inequality in the chocolate industry, set the example that chocolate can be made differently and inspire the chocolate industry to make 100% slave free cocoa the norm in chocolate. We are crazy about chocolate & serious about people. Our own people first. Because only with the most driven people can we reach our goals and make 100% slave-free the norm in chocolate. We want to be the best employer an employee can wish for. We invest in personal development, reward initiative and cultivate a very pleasant work environment. Equality, solidarity, lots of fun and performance are central to this. At the moment we are 127 Tony’s strong, of whom 90 work at Tony’s HQ in Amsterdam (the Netherlands) and 8 at Tony’s Office in Portland Oregon (in the US), and 4 Tony’s in London, UK. There are also 25 super stars that work in Tony’s Super Store in the heart of Amsterdam.